St Pete, Tampa Bay and surrounding areas! Prepare for another day of activities, music, food, and the unity of our community! Beginning at 4pm, you and your family are invited to spend the day together with outdoor kids activities, card games and enjoying the BBQ, seafood, slushies, and vegan foods offered by local vendors! Starting at 5pm, local singers, rappers and musicians will take the Black Power 96 Sound Stage to live entertainment! Black Power 96.3 FM has so much to celebrate! We’re on the way to raise our radio tower to 70 feet and expand our coverage area! We’ve added two new local shows to our dynamic line-up! Dj Heavy Love and Eddie “Florida Blind Boy” Maultsby has joined the Black Power 96 family with their shows The Love Train, The Southern Soul Express and the Florida Blind Boy Show! Regular on-air giveaways of concert tickets and grocery cards are providing much-appreciated resources to South St. Pete. Every week our #OperationBlackout outreach team hits the streets, going door-to-door and setting up tables at supportive businesses to let everyone know that Black Power 96.3 FM is here to serve our black community!! Black Power 96 serves as da Burg’s ONLY black-owned radio station with a mission to defend the human and civil rights of the African community and addressing the grave disparities in health, education and economic development faced by this community. Black Power 96 serves the interests of St. Petersburg’s black community, not the far away big corporate interests of iHeart or CBS. This small station with studios at the Uhuru House provides free training in professional broadcasting and access to the radio airwaves for our local talent, organizations and businesses. 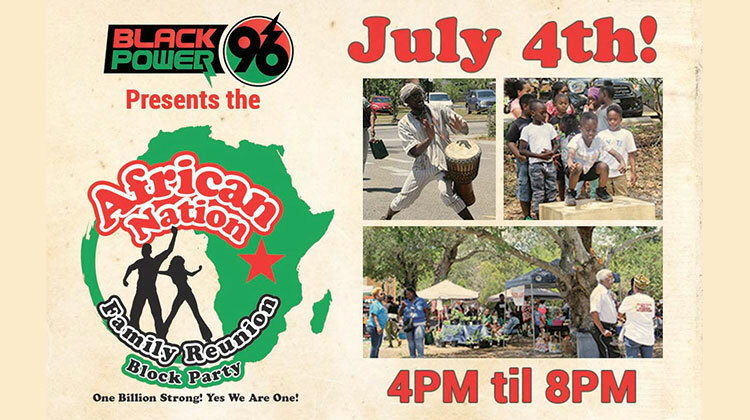 Black Power 96 has established an institution in the “African Nation Family Reunion Block Party” that celebrates freedom and independence for African and other oppressed peoples everywhere. The African Nation Family Reunion Block Party will take place at the Uhuru House, located at 1245 18th Avenue South in St. Petersburg. For more information on the African Nation Family Reunion Block Party or to volunteer with the radio station, call 727-914-3614 or stop by the station Monday to Friday between 9am – 5pm.